Since receiving our construction permit on Feb.6, I have kicked into high gear to get the station built. The studios are coming along nicely, with the control room near completion. Wiring of the production studio is nearly done, with the layout of this area next on the list. Fundraising also is continuing as we work to reach our $6k goal. This is to help with the costs of the transmitter, antenna, EAS, and tower. The tower itself is funded, but not the cost of parts and installation. 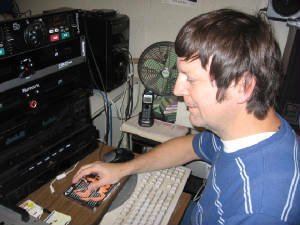 I am setting a goal of June 15 for signing the LPFM on the air. If you can help, please call me at (850) 877-4641 or email alanmccal@hotmail.com. During the month of February we received donations totaling $1,029. One of our donors got things off to a good start by donating $500! At this point we have acquired through contributions or purchase our building, the majority of the studio control room equipment, most of the production room equipment, an EdenPure heater for the building, an AC unit, kitchenette equipment and shelving for the music library. Still needed are the transmitter and antenna (about $4400), a 170 foot tower (estimates vary), and an EAS CAP compliant box ($2500).These are the must-have items. Our primary computer needs updating. Our default computer and the hard drive with a back-up music library and automation will total arou d $3000. This is for our authorized 24 hour operation. If you can help, please make a contribution to Delta Star Radio, 2625 Doll Place, Tallahassee, FL 32311. All contributions go to the construction of WDXD-LP. Thank you! Let's buikd a new radio station!